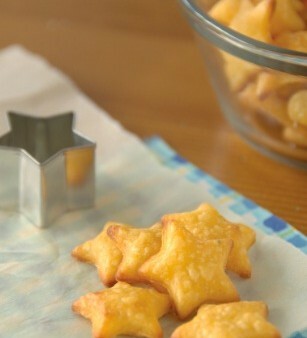 These corn-free, crunchy little crackers pack big cheddar flavor and make a pleasing snack for children and adults. Be sure to grate your own cheese since pre-grated varieties often contain cornstarch to prevent clumping. 1. In the bowl of your food processor, fitted with a metal blade, place all ingredients except the ice water. Process the ingredients for approximately 1 minute in short pulses. 2. Add 3 tablespoons of the ice water and continue to process ingredients for 1-2 minutes (this time continuously) or until the dough begins to form a ball and “rides” the food processor blade. Add 1-2 more tablespoons of the ice water if needed (if the dough never comes together, then you will need to add the additional water). 3. Scrape the dough onto a piece of plastic wrap and wrap tightly, pressing the dough into a disk shape. Chill for 30 minutes (up to overnight) in refrigerator. 4. When ready to bake, preheat oven to 375° F. Working with 1/3 of the chilled dough at a time, roll out on a lightly dusted counter-top (rice flour works well). If your dough is crumbling apart when you try to roll it, you may need to knead it for a minute or two to warm it and make it more pliable. 5. Roll to 1/8-inch thickness and cut shapes with desired cutter. I prefer small, bite-sized shapes, but larger-sized crackers work too, just increase baking time accordingly. 6. Place cut shapes on a parchment-lined cookie sheet with a thin metal spatula that has been dipped in rice flour. Bake in the center of the preheated oven for 6 to 8 minutes, or until they have puffed up and are just beginning to turn golden brown on the edges. 7. Remove from oven and carefully slide the crackers off onto a cutting board to cool, making sure that they are in a single layer and not piled on each other. 8. Cool completely and store in an airtight container. Baking time: 6 to 8 minutes. Chilling time: 30 minutes to overnight. Recipe by Terris Cleary. For more information, tips and recipes visit her website at FreeEatsFood.com.